Winter Gem is one of the best-flavoured new apple varieties developed in the 1990s by the late Hugh Ermen. 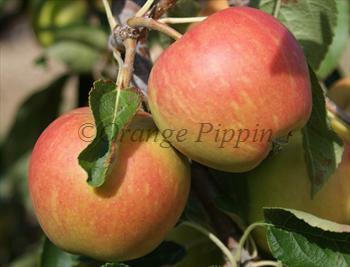 It is a cross between Grimes Golden and Cox's Orange Pippin, and as you might expect has a pronounced aromatic flavour. Grimes Golden is not that well-known in the UK but is the probable parent of Golden Delicious. Some enthusiasts reckon that Grimes Golden is a better apple than Golden Delicious, as it has the same sweetness but with a bit more richness. This means that Winter Gem inherits characteristics from two of the most influential apple families in the world, and if you appreciate apple flavours it is well worth trying. As the name suggests, Winter Gem is a late-season apple, and the apples can be stored for several months. Please fill in the details below and we will let you know when Winter Gem apple trees are back in stock. Winter Gem is in flowering group 3. Winter Gem is self-sterile and needs to be pollinated by another tree of a different variety nearby. Since it flowers in the middle of the blossom season it can be pollinated by most other apple trees. Unlike either of its parents, Winter Gem is well-suited to UK gardens - indeed this is a characteristic of many varieties developed by Hugh Ermen. It can be a light cropper (although this is perhaps part of the reason for its good flavour). Make sure there are suitable pollination partner varieties nearby - Red Devil, Srumptious, Falstaff, Saturn and Charles Ross would be good choices. In other respects it is quite easy to grow. Winter Gem works particularly well as a small tree on a dwarf or semi-dwarf rootstock. On more vigorous rootstocks it will produce a large and attractive tree. Winter Gem is a cross between Grimes Golden and Cox's Orange Pippin, and was developed in the UK by Hugh Ermen.